Home » Global » Stop Pentagon war moves against China! 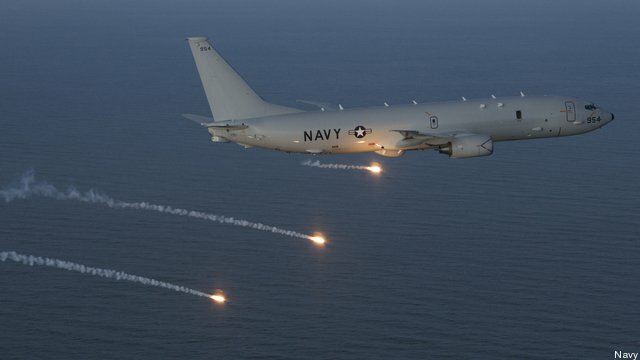 U.S. Navy’s P-8 Poseidon surveillance jet launches flares over the Pacific. The U.S. military replied that the plane was over international waters, even though it was close to 12 miles from the reef. “I am a military aircraft conducting lawful activities,” added the U.S. plane. The Chinese warned the spy plane off eight times, to no avail. The U.S. surveillance flight came less than a week after the USS Fort Worth, a Navy littoral combat ship designed for near-shore operations, passed close to the islands, where the Chinese are dredging sand and building up five reefs. These were deliberate provocations staged by the Pentagon as part of a planned campaign to escalate Washington’s military pressure on the People’s Republic of China. It is the implementation of the so-called “Asian pivot” announced by President Barack Obama. To unfold such a plan under the banner of defending “freedom of the seas” is ludicrous. For one thing, the U.S. is one of the few countries that has not signed the 1982 U.N. Convention on the Law of the Sea, although it participated in drafting much of the language. This is a reflection of the imperialist arrogance and presumptuous, great-power chauvinism of Washington. The Pentagon regards the Pacific as a “U.S. lake.” What else could explain the military challenging China’s right to build up islands a few hundred miles from its shore, when California is more than 6,000 miles away? What right has the U.S. ruling class to have its Navy conduct patrols in the Pacific region to “ensure freedom of the seas,” but not allow China to promote its interests in the region? The answer is that it has no right, except the right based on military force by a power that has devastated Asia, beginning with the U.S. intervention in China during the Boxer Rebellion of 1898-1900 followed by the slaughter in the Philippines in 1898-1902 and colonization of that country — to say nothing of the atomic bombing of Japan in World War II, the brutal Korean War, the genocidal Vietnam war, the bombing of Laos and Cambodia, and the CIA-backed massacre of a million people in Indonesia in 1965-66. The Council on Foreign Relations is the think tank of a major section of the U.S. ruling class. Its members include former Defense secretaries, former heads of the State Department, generals, admirals, ruling-class military intellectuals, strategists, etc. In April the CFR released a report titled “Revising U.S. Grand Strategy Toward China,” written by Robert D. Blackwill; Henry Kissinger, Senior Fellow for U.S. Foreign Policy; and Ashley J. Tellis, Senior Associate, Carnegie Endowment for International Peace. Strengthen the U.S. military. “Congress should remove sequestration caps and substantially increase the U.S. defense budget. … Washington should intensify a consistent U.S. naval and air presence in the South and East China Seas” and “accelerate the U.S. ballistic-missile defense posture” in the Pacific. The report has the earmarks of the campaign that was devised to bring down the USSR. It is formulated by former Cold Warriors. It aims to promote military encirclement, which would divert economic resources and disrupt national economic planning. During the time of the USSR, the U.S. set up a wide blockade on technology transfer, with the aim of depriving the Soviet Union of modern economic tools for national development. And, of course, Washington fashioned global alliances such as NATO directed at the USSR. What is being proposed by the CFR is a milder version of the Cold War full-court press. But the goal is clearly to undermine the People’s Republic. The problem for the imperialists is that China already has the technological and industrial capability to withstand such a campaign, should it be implemented. But the important point is to be aware of the aggressive thinking in the highest imperialist circles concerning China. And to note that the recent provocations are not just arbitrary or momentary. They are part of a longer-range plan. Washington regards China as a hostile class power — unlike Russia, which is a fully capitalist country with imperialist investments and an upstart oligarchic ruling class. Created on the ruins of the nationalized economy of the Soviet Union, it is looking for its place in the sun of imperialism. Wall Street and the Pentagon have a different idea. They want to take Russia over. Thus Russia is in conflict with the U.S. imperialists on many fronts, and the oppressed countries can and should take full advantage of this. 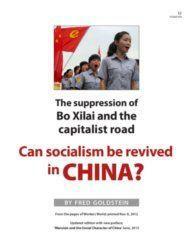 But China is more or less a compromise of socialism with capitalism. The socialist foundation must be defended against counterrevolution. The planning principle and state-owned enterprises dominate the economy, although it is riddled with capitalism and corruption. The Communist Party of China, the state banks and big state industries are combatting the current economic slowdown and trying to advance employment. China is managing this slowdown while economic stagnation and recession are plaguing the capitalist world. This includes Russia, which is in the grip of an economic crisis, with its gross domestic product, sales and wages falling — unlike China, where wages are rising. The goal of U.S. and European capitalism is to destroy the state enterprises in China, privatize them, undermine the Chinese Communist Party and politically enthrone the capitalist class. Both China and Russia must be defended against imperialism when they are under attack. But no one should overlook the difference between a distorted socialist country with capitalist inroads and a state fully in the hands of an exploiting class. While the overriding threat in the Pacific right now is the provocation by U.S. imperialism against China, the fact that China is expanding into territory long claimed by Vietnam and within Vietnamese territorial waters must not be lost sight of. China may have legitimate commercial and defense interests in building up the Spratly Islands/Truong Sa Islands. But it is incumbent upon China, both as a great power and as a country with claims to socialism, to defer to Vietnam and to work out territorial relations under conditions that are mutually acceptable and agreed upon. It is one thing to expand military and commercial positions to be better able to protect against imperialist incursions. It is another thing to expand territorial claims far beyond any legally recognized boundaries and disregard the territorial claims of Vietnam, or the other nations that have claims on the islands, including the Philippines, Taiwan, Malaysia, Indonesia and Brunei. Acting in a high-handed manner with respect to small nations, especially with respect to a sister socialist country like Vietnam, both demeans China and increases the space for U.S. imperialism to create divisions and conflict. Washington is fishing in troubled waters by sending its military into a contested region. It has no business in these waters. Its aggressive military and political maneuvers that foster division are meant to serve imperialist purposes and should be shunned by China first of all.